Q. Where can I find info on patents and trademarks? From the hom page do a search for the patent name. 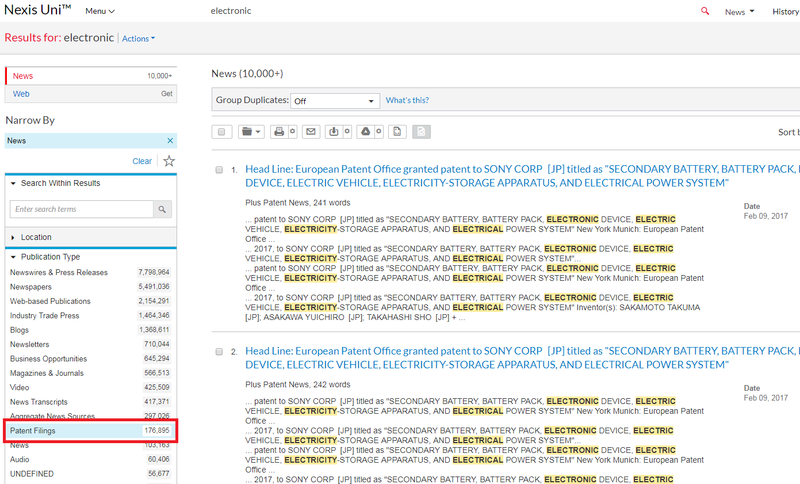 From there, under 'Publican Type' on the left hand side, select 'Patent Filings' and the results will appear. Also; look at the U.S. Patent & Trademark Office - USPTO. The office's Patent Statistics Reports Available for Viewing includes statistics on patents by class; by year; by geographic origin; by patenting organization; by inventor; and by patent activity. Two reports; U.S. Patent Activity 1790 - Present and U.S. Patent Statistics Report may be of particular interest. NBER U.S Patent Citations--National Bureau of Economic Research. Also see the library's Copyright Reference Guide for several useful resources on copyright and fair use. For additional resources visit U of I's Online Journals and Databases. Try searching for a word like "patents." Please note: pending patent applications are included in Derwent and USPTO. However applications are not published until 18 months after the application is filed.